WASHINGTON — FERC was given no advance notice of President Trump’s directive Friday ordering Energy Secretary Rick Perry to prevent further nuclear and coal plant retirements and has been provided no details since, officials said Tuesday. 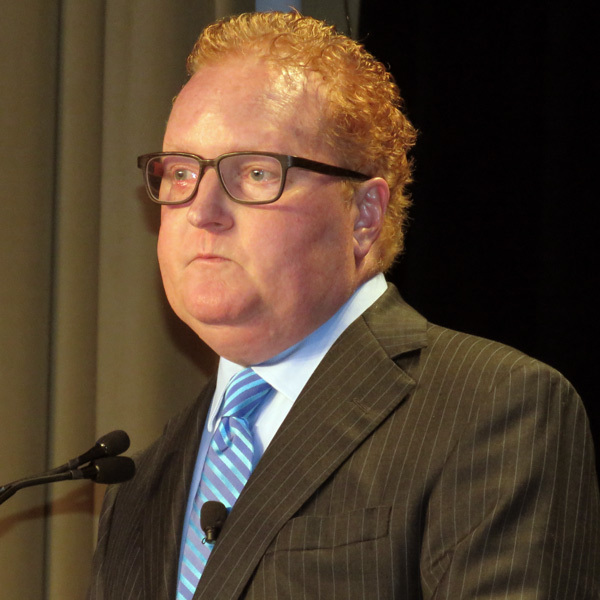 FERC Chairman Kevin McIntyre and Department of Energy Undersecretary Mark Menezes had few answers for reporters’ questions in brief press conferences after speaking at the Energy Information Administration’s 2018 Energy Conference in D.C. on Tuesday morning. Menezes told reporters DOE is still working out the details of the plan. He said the department would not necessarily be ordering RTOs and ISOs to purchase energy or capacity from at-risk plants — as was detailed in a DOE memo leaked last week — but that it was one of the options under review. He did not respond when asked why Trump had made the directive last week when the details were uncertain. McIntyre told reporters that he has not been briefed by DOE nor seen a list of plants that might be affected. “We had no idea” the directive was coming Friday, an exasperated senior FERC official told RTO Insider afterward. Asked about DOE’s contact with FERC, Menezes said, “We talk to FERC on a fairly regular basis. We have not got into any specific proposals with FERC because we’re still working on specific proposals. “This is a process that is bigger than the Department of Energy. … We’re getting input from all of … the agencies as to how they assess this,” he continued — an apparent reference to the National Security Council’s Policy Coordinating Committees. FERC is not a principal in the process. McIntyre said the Trump administration’s directive is within the law under Federal Power Act Section 202c. McIntyre said FERC might not be involved in setting prices on rescued generators if they can reach agreements on compensation with RTOs. If FERC is not involved, the contracts would be judged on an “easier standard” than FERC’s traditional determinations of “just and reasonable,” he said. 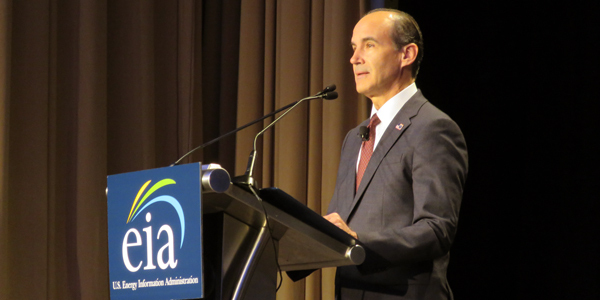 McIntyre also discussed Trump’s directive in response to audience questions moderated by EIA Administrator Linda Capuano after his speech to the EIA conference. If the 202c “trigger is pulled,” McIntyre said, generating plants could attempt to work out a contract with the entity providing it compensation. “If that effort should fail, then the matter could [come] up to the FERC for what FERC would regard as — for lack of a better term — a rate case … which the FERC has been handling for decades. So, from that standpoint it wouldn’t be a dilemma. In a sense it would almost be bread and butter. We’d have to figure out how to get the dollars and cents right, that would be probably the biggest [challenge]. We’ve got a very talented staff” to do that. “If it comes to us a rate proceeding it would indeed be subject to [just and reasonable],” McIntyre added in the press scrum later. But a contract negotiated between an RTO and a generator — “something [that’s] worked out almost in a settlement fashion [is] subject to … effectively an easier standard … fair and reasonable,” he explained. In his remarks to reporters earlier, Menezes indicated the policy initiative was far less settled than the memo suggested. He said there is no deadline for DOE’s next step. “Why did the president announce this Friday if you don’t know what you’re doing?” Menezes was asked. The undersecretary dismissed the suggestion that the administration is threatening to disrupt RTO power markets. “FERC has to figure out a way to keep the so-called ‘markets’ operating. But they are voluntary,” he said. “These markets have not been mandated by Congress. … It’s important for the RTOs to keep their states happy. If the states are not happy with the RTOs in which they participate, the RTOs won’t exist. … These are not natural markets. In fact, electricity is a natural monopoly,” he said. 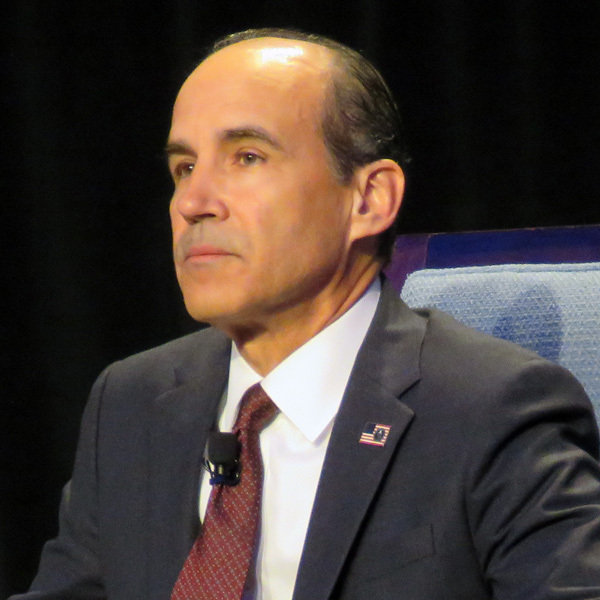 During his address to the EIA conference, Menezes decried the grid’s “growing dependence on pipeline-dependent and intermittent resources,” noting that there are no mandatory reliability standards for gas pipelines. He also said the premature closures of nuclear plants has Saudi Arabia and other nations “questioning our commitment to remain leaders in nuclear technology.” He said that has opened opportunities for South Korea, which won nuclear generation contracts with the United Arab Emirates, and China, which he said does not require clients to sign the antiproliferation protections the U.S. mandates.